“I can hear my voice,” shared a teary-eyed women who introduced herself to me last week at the conclusion of a seminar I conducted in a leafy suburb on the outskirts of Boston. “It is screaming at me,” she said. She went on to tell me about how emotional she’d been throughout the seminar – a two-hour affair designed to let participants play with the concepts of transition. She was clear about the action she needed to take. She knew it. It didn’t eliminate the sheer terror she felt as she contemplated taking that next step. Her comment instantly deposited me at the doorstep of actions. In this season of New Year’s resolutions and renewed personal commitments – are you readying to act? For me the connection between voice and action is a strong one. Here is how I think about it. Transition occurs – very often – when what holds value or meaning to us begins to shift. A sudden change in health status can trigger a transition. So too, a marriage. Countless events or feelings – like boredom – can serve as triggers to transition. Here’s the rub – triggers don’t guarantee a transition. They simple deposit us at the opportunity for action. The decision to act is entirely our own. So what about the voice side of the equation? At its simplest I’ve come to believe that voice directs our actions. I tend to think of voice as the unfiltered expression of who we are. Missing from our voice should be things like expectations of what we should or could do. It’s simply ourselves. Core. Authentic. True. This week I’ve been developing a work plan for 2016. Thanks to this time I am now thinking of my work as a social entrepreneurship project whose objective is to raise the capacity for transition in women. It is great fun to think about how to advance this agenda. Suspend Self-judgment: I want to champion awareness and understanding of transition for women – everywhere. The start of that commitment was the publication of my book Women & Transition less than 90 days ago. My ever judging voice wants to classify that initial project. Was it a success or failure? Yes – it is out and has not yet been named to the NY Times Bestseller list. Have I failed? I know that I need to suspend judgment and focus on the continual process of testing and learning that the book enables. But I am battling the pressure of society that would lead me to say – failure. It takes a real effort to train my voice to be aware of those false classifications and continue on…amplifying – refining – impacting others – enjoying. Summon the Courage – Daily: I feel like I’m back in my early tech start-up days. I swim in a sea of no’s. I constantly receive no’s on my proposals to write or speak or appear in the media. But every once in a while there is a yes. The courage to continue needs replenishing almost daily. Here is the math that keeps me going: 74 versions of the book’s proposal; 6 rejections before one editor agreed fund the project; 3 versions of the manuscript before my voice emerged; 1 published book. Last week my daily courage battle learned that support comes from all corners – including one teary-eyed thankful participant. Dignify Your Dream: Our voices matter – not only to ourselves and our families but to the world. To keep myself anchored on this point I cling to the reactions I received from attendees at the very first ‘trial’ seminar I did last fall before the book was published. I told the women present two things: that the world needed their voices; and that it didn’t matter what their voice said. Poet. Acrobat. Caregiver. CEO. Friend. It doesn’t matter what it is – just that it is. These women were astonished by my belief that their voices mattered – not only to them but to our greater good. I believe this to my core. I will never forget the surprise on their faces as they understood my belief that their voices really mattered…. In ’16 I hope you can find moments to cultivate your voice and begin to act in alignment with what you hear. May your knowledge of transition help you summon the courage to do both…. 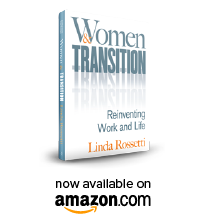 This entry was posted in Observations on Transition and tagged career transition, linda rossetti, observations from a women's transition, personal transition, transition, Women and Transition by Linda Rossetti, women's issues, women's professional transition, women's transition. Bookmark the permalink. There is so much to say about this post, but most of all that it is wonderful, honest, raw and thought provoking on many levels. You have done such a fabulous job with your book and this topic, Linda and think this is just the beginning. I am looking forward to seeing where this takes you in 2016. Thank you Valerie! I struggled with how to write a New Year’s post for almost the entire month. Glad to hear that what finally came out was thought provoking and true. Happy ’16! Perfect and timely as usual. I see myself in you and remind myself of the same lessons. Thanks for holding up the mirror!